Will the Company Town lose its magic? The first in an occasional series exploring the impact of continued corporate downsizing on the region. Thanks of a special sort are in order: Pop guru Spencer Johnson, co-author of The One Minute Manager and purported master of "taking complex subjects and presenting simple solutions," also has given the world Who Moved My Cheese? Populated by mice with names like Hem and Haw, WMMC? bills itself as "a simple parable that reveals profound truths about change." The "cheese" stands for "what we want to have in life," like a job and a future. You "can enjoy less stress and more success" as forces reshape the world you live in, says the book. "Movement in a new direction helps you find new cheese." Got laid off and need a new job? Work on your attitude, and pack your bags. Something seems to be missing. "They never answer the question of who moved my cheese,'" says Vincent Serravallo, a Rochester Institute of Technology sociology professor who uses the book in his classes. You're just supposed to accept the fact that it moved, he says. "You've got to be fast on your feet," he says, interpreting the book's message. "Rather than 'hem and haw,' you've got to shift to the next opportunity." Plenty of Rochesterians must be chewing on this sort of thing. Report after report chronicles this area's shifting --- and sometimes shifty looking --- fortunes. "Continuing in 2002 was a worldwide workforce reduction, with the final phase to be completed in 2003," says Kodak's last annual report. The company announced 3,000 layoffs here this past July. Since the early 1980s, the number of Kodak jobs in the Rochester area has fallen from more than 60,000 to around a third of that. Some far-flung events have been emblematic: Two years ago, for example, Kodak opened a large single-use camera manufacturing plant in Xiamen, China. A report from Photofinishing News showed CEO Dan Carp, et al., smiling and holding "magic wands" aloft as part of an inaugural ceremony in Xiamen. "I've been arguing that the last 15 years have been a watershed," says Robert Manning, a humanities professor and expert on trade and credit who works with RIT's Center for International Business and Economic Growth. Manning notes the lack of a national economic policy in regard to the huge shifts underway. "But without regional economic policies," he says, "there's no pressure" toward such national policy. He adds that George W. Bush "has manipulated tariffs and subsidies to favor areas of his political strength." This echoes what the late Senator Daniel P. Moynihan often said: that New York doesn't get back a fair share of the money taxpayers in the state send to Washington. These developments, says Manning, are "not accidents, they're carefully planned, long-term decisions" with "huge costs." He notes a tragic irony: War-related federal subsidies flow to contractors like Halliburton, while "the grunts in the National Guard" and their families pay the piper. The costs are personal and social --- like increased child-care expenses for single-parent families keeping their home fires burning. Is economic globalization is behind all of this, particularly in an export-oriented area like Greater Rochester? "I think a lot of people miss that link," says Manning. One link he says people should examine is environmental policy. We should press for stronger environmental standards offshore in our own interest, he says. But just what kind of economic activities should we cultivate to replace what's being lost? In the typical discussion, Rochesterians say biotechnology and the like will revive the area's economy. Manning says medical facilities and research will be vital to the area's economic health. But, he says, "just because it's high-tech doesn't mean we should bring it in." Whatever we do, he says, has to fit with the larger needs of the community. "I'm not a huge optimist," says Manning. "You have to have forward thinking. What I see [here] is backward thinking" rather than "getting outside the box." That's especially problematic, he explains, at a time when the "competition cycles" have sped up. He anticipates there'll be "more pressure for public works projects" --- but he says that path has its limitations. Manning also looks at how individuals fit into the world of modern industry. "The focus on technology means that people are interchangeable," he says. 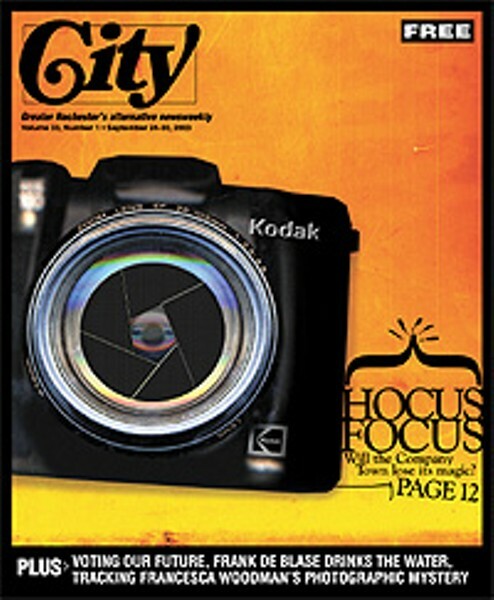 "I'm holding my breath for the next round of [Kodak] layoffs in October." He anticipates the layoffs will increase the number of local retirees, and that this will portend further change. Manning notes that RIT is creating a retirement community of its own. But there are potholes ahead: "A lot more people than you think are whittling down their retirement savings" to meet present needs, he says. Will Kodak shrink to nothingness, leaving us with an empty industrial shell or even the kind of vast brownfield that Bethlehem Steel bequeathed to Lackawanna, Erie County? Manning doesn't see that kind of abandonment happening here, exactly. "It's in [Kodak's] interest to get the best value for their property," he says. Indeed, Kodak's withdrawal some years ago from the town of Gates --- the company's closing of the Elmgrove plant --- didn't leave a huge hole in the ground. The 500-acre site, with 5 million square feet of floor space, was resurrected as Rochester Technology Park, helped by the usual public giveaways. This past July, for example, it was announced that Heidelberg Digital will receive around $140,000 in county and state tax breaks to expand at the park and increase its workforce there. But Heidelberg inherited some Kodak operations years ago, so its "return" to the former Elmgrove site doesn't mean a big net gain. "Heidelberg has cut workers this year, and officials have said the expansion will bring employment back to current levels," said a Technology Park news release. Moreover, after years of fishing for tenants, the Technology Park still advertises that it's "ready to lease space and shovel-ready sites totaling 350 acres," i.e. there still are ample vacancies. And if this is true of the former Elmgrove plant --- a site that, unlike older industrial areas throughout the region, has fairly new buildings and uncontaminated land --- how much truer will it be of a downsized Kodak Park? The city of Rochester, host to the bulk of Kodak Park, stands to be a big loser from Kodak downsizing, of course. It's part of a generalized malady. In a WXXI-TV interview last year, Mayor Bill Johnson said the city has lost nearly a billion dollars of its tax base in recent years, much of this loss from a "declining presence of commercial and industrial businesses." But the ripples will move out through the town of Greece, too. Kathryn Firkins, Greece's director of constituent services, says the full-value assessment of Kodak property in the town is $122.5 million. But it's going down: "We negotiated an assessment decrease some time ago; 1998 was the last negotiated settlement," she says, adding that further adjustments would depend on future talks. The town has felt, she says, "that it was better to have a gradual decrease." In any case, the decline hasn't stung Greece too hard; as Firkins says, the overall valuation of property in the town has continued to rise. Still, the numbers tell a story: In 1988, says Firkins, Kodak's properties accounted for 18 percent of the overall town assessment; they now account foraround 6 percent. Individual choices will cumulatively remake Rochester and its suburbs. But so will collective choices. Which leads the discussion toward the complement and counterweight to politics and the rule of money --- civil society. Pamela Couture, a Colgate Rochester Divinity School professor of practical theology who serves with the United Methodist Bishops Initiative on Children and Poverty, has thought along these lines. Rochester's "civic and activist organizations are alive and well," she says. She recalls her years in Atlanta, Georgia, where people had "a sense of being on the cusp of the future." That doesn't characterize her new home --- but Couture isn't dismissive. "I think the signs of life are more significant than the signs of death [here]," she says. "There's an elasticity, a responsiveness in Rochester." Couture cites the example of what she calls "a tall-steeple church" in Fairport. Members of this Methodist congregation, she says, "decided to put themselves in situations they're uncomfortable in." This translated into partnerships with residents of the city's poorest neighborhoods, she says. So where's the beef? Couture says church members linked up with the "Reality Tours" conducted by the local antipoverty groups. In such collaborations, she sees much worth building on. "That's what's become exciting about being here; I've become a convert to Rochester," she says. "There's globalization that hits right at your doorstep," says Couture. The Third World experienced this first; now it's hit home, she says. And it's hitting the very institutions of civil society that make Rochester what it is. "I have a concern about what's going to replace the corporate money to keep the culture alive," she says. The Syracuse example is nearly as stark. Former Syracusan Patrick Domaratz, a labor relations specialist with the local New York State United Teachers office, is now a city of Rochester resident. He's got a strong sense of déjà vu. "I actually lived through the downsizing of General Electric in Syracuse," he says. At one time, he says, tens of thousands were employed in GE's facilities there; today around 2,000 work there for GE's successor, Lockheed Martin, now the "anchor tenant" at the huge plant along the Thruway. Domaratz says his family came from Pittsburgh originally; they landed in Syracuse in the 1950s specifically to work for GE. His father worked at the plant, he says, from 1956 to 1973. "They used to make television sets and radios there," he says. "Hard to imagine today." Later the father worked at a GM Fisher Body plant in Syracuse. "It's now a Delco plant in Valle Hermosa, Mexico," says Domaratz. He rattles off names of other corporations that have sent jobs offshore, like Carrier, a major presence in Syracuse since 1937. Syracuse's post-industrial evolution hits the Domaratz doorstep, quite literally. Domaratz says his mother's comfortable suburban home, situated near a four-acre park, sold for just $53,000 in 1998. He says that's less than his own modest home in Rochester now is worth. "It screams out what's happening in Syracuse," he says. He's well aware of the state of downtown Rochester --- but downtown Syracuse, he says, "has tumbleweeds blowing around." Corporate management and organized labor in Syracuse had a mutually beneficial arrangement for many years, says Domaratz. Then management, he says, "broke the contract. They dumped thousands of jobs... Syracuse found that ages 18 to 34 were leaving." The inevitable followed. The corporations, he says, "sought to lower their tax assessments because their facilities weren't being used." This led, he says, to cuts in public spending "shoved down the back of laid-off workers who owned property." Domaratz may be suffering from déjà vu, but he's not fatalistic. He points to hopeful signs in another community he knows well: Buffalo. There, he says, the Western New York AFL-CIO Development Group has begun a very targeted urban-development project: building small power plants in the urban core. The plants, to be connected to an existing "loop" within the urban core, will burn wood and "selected garbage," he says. The project, he says, is designed as "an economic engine for sustainable jobs, a sustainable environment." And the Development Group, he says, is designed to "spread the benefits of unionism through longtime partnerships." Nor is it all abstract and intentional: Domaratz notes that union pension funds can be invested in "making something for the community rather than sinking it in Wall Street." In this connection, he says Buffalo activists are looking at rehabbing lots of the city's vacant homes. (Some of them are the famed "Buffalo bungalows" that have been threatened by latter-day urban renewal plans.) The rehabs will put local building tradespeople to work, as well. As one whose job entails sifting data and digesting documents, Domaratz says the Development Group is fostering something "different from the breakfast-club mentality." He doesn't add the obvious: the Buffalo initiative isn't another corporate appeal for cutting taxes and boosting "competitiveness" --- it's about determining where the cheese will be and letting people actually get a bite. Coming up: A closer look at effects on the ground --- people, communities, the environment --- here and throughout the region.